Earlier I had written about how banks are unethically debiting customer accounts on account of their hidden charges. Come April 1 and some private banks would be increasing their service charges making banking even more expensive. ICICI bank has increased the penalty from Rs 250 to Rs 350 in case the monthly average balance amount is between Rs 5000 to Rs 10,000 for metro and urban customers. In case this amount is below Rs 5,000 you would be charged Rs 450 up from Rs 350 charged earlier. Also for semi urban areas this charge has been increased by Rs 50. In addition to this, ICICI Bank would charge Rs 5 per thousand (minimum Rs 150) for cash deposited at its branches which in a different city than the account of account holder. Until now one cash transaction was free every calendar month. Thankfully first cash deposit through machine would be free. HDFC bank too has increased its charges for non maintenance of minimum average Monthly balance to Rs 150 to 600 depending on the type of account and balance in urban areas. For semi-urban areas this charge would vary from Rs 150 to Rs 300. This is hike of up to 70% above the existing charges. HDFC bank would also charge its customers Rs 75 for additional cheque book request of 25 leaves beyond the first. Axis bank (Prime Plus Account) would charge Rs 5 per Rs 100 of shortfall in minimum average Monthly balance subject to minimum charge of Rs 350. The existing penalty was Rs 250. Kotak Mahindra bank has also hiked its charges for non-maintenance of minimum average Monthly balance from Rs 250 – 400 to Rs 300 – 500 depending on the type of account and balance. RBI (Reserve bank of India) in November 2014 had asked banks to inform customers about non maintenance of minimum average Monthly balance amount and their charges. So banks would now send SMS, email or letter to inform about the same amount and give a grace period for 30 days to meet the balance requirement. In case you still do not deposit required amount bank would levy their charges for both ‘default month’ and ‘notice month’. 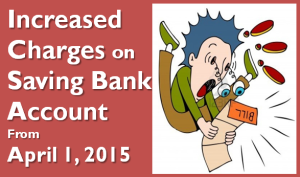 Go through the Fees and Charges page on respective bank’s website. They are mandated by RBI to publish all charges on this page.